To make this bread you need to use a ‘starter’ mixture that takes the place of yeast. The starter takes about five days to develop (or you can buy it online), but once you have it you can keep it alive and use it whenever needed. 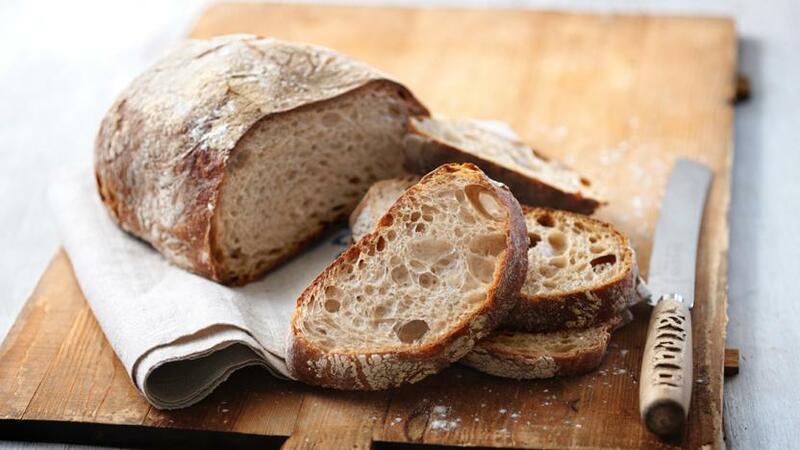 Mix together the flour, sourdough starter and water in a bowl. Add the sugar and salt. Turn out on to a clean kitchen surface and knead for 10 minutes or until the 'windowpane effect' is achieved (where the dough can be stretched until it is so thin that it becomes transparent). Put the dough into a lightly oiled bowl, cover with a damp tea towel and let it prove for 2½-3 hours. You won't notice as much of a rise in the dough as you would with a normal, yeasted bread and it will take a lot longer. Turn out the dough onto a clean kitchen surface and knock back. Portion the dough into two and shape into two ball-shaped loaves. Flour generously, and place each loaf seam side up in a bowl, lined with a couche cloth or a heavily-floured tea towel - without the cloth, your loaf will stick in the bowl and you won't be able to turn it out. Leave to prove for a further 2½ hours.